This truly is an amazing place to stay, you will wake up in a Serengeti like environment and ask yourself - am I in Kent... or Africa? This unique experience is a must for wildlife lovers and adventurers alike. Bear Lodge is situated in the 600 acres of Port Lympne Reserve with unrivalled views across the Romney Marsh and English Channel. Enjoy a remarkable array of exotic rare and endangered animals with many roaming free across the African and Asian experiences. The Aspinall Foundation is an internationally renowned animal conservation charity that works in conjunction with Howletts and Port Lympne Wild Animal Parks. Together they are committed to the breeding, reintroduction and protection of rare and endangered species. Howletts and Port Lympne Wild Animal Parks are different from conventional zoos, the focus is on providing as natural an environment as possible for the animals in their care, to facilitate our successful breeding programmes. The Aspinall Foundation is a charity that relies on support from the general public to fund its back to the wild programme, and vital animal protection projects in Africa, Madagascar and Java, as well as other projects around the world that are protecting some of the world's most endangered species. Regular evening activities include walking tours of the park, animal feeds with a ranger and evening safari tours of the park when it is closed to the general public. This offer is based on a luxury tented lodge. 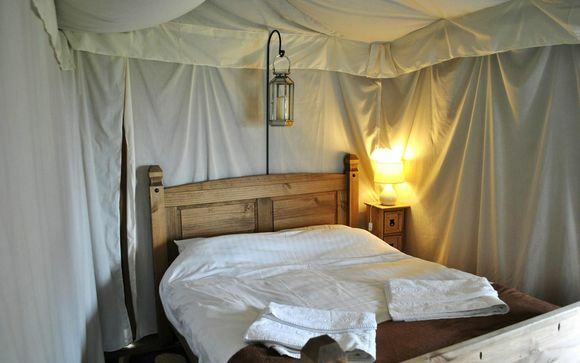 Bear Lodge is the perfect experience for those looking for a unique 'glamping' holiday. Each of the luxury tented lodges sleeps up to 6 people sleeping in 1 double bed, 1 double cabin bed and bunk beds. A sofa bed is available for a further 2 guests at a supplement (contact Bear Lodge direct). Bear Lodge site is situated overlooking the Reserve and offers stunning views of the cheetah enclosure and across the Romney marsh to the Kent coastline. For families with younger children, you can keep an eye on the kids while relaxing on the verandah of your tent by the play area. The private entrance to the lodge allows you complete freedom to come and go as you please and explore the area of outstanding natural beauty that Port Lympne is located in. £50.00 upgrade per night for additional sofa bed to sleep a further 2 guests - to arrange please call Port Lympne direct. This offer is based on a Self Catering stay. The tents do not have full cooking facilities, however tea and coffee making facilities are available and each tent has a small fridge. The on site Club House Restaurant offers a delicious breakfast and dinner for an extra charge. Port Lympne Reserve is located in the South East of England in Kent, and is within easy reach of the home counties of London, Surrey, Sussex, and Essex. You can reach us by road, rail and bus. Unlike many attractions, Port Lympne Reserve is open all year, including Bank Holidays, with the sole exception of Christmas Day. Port Lympne Reserve is approximately a 1 hour and 20 minute train journey from Charing Cross or Victoria railway station in London, or approximately 40 minutes from St Pancras International, London, on the high speed service (Please see Southeastern website for details). Take the train to Ashford International station, and from here take a bus journey from the domestic station side. The Stagecoach East Kent number 10 bus runs between Ashford and Folkestone via the reserve. For bus times please call 0871 2002233 If you prefer to travel by Coach, find your nearest service to Ashford International before connecting with the Stagecoach bus service. If you are travelling by road Port Lympne Reserve lies on the B2067, and is just past Ashford, Kent, 5 minutes from J11 of the M20. It is a short distance from Canterbury, Folkestone and the southeast coast of England. The postcode for Bear Lodge is CT21 4LN. Parking available for 2 cars at Bear Lodge. Additional cars are able to park at Port Lympne Reserve. This offer is non refundable.